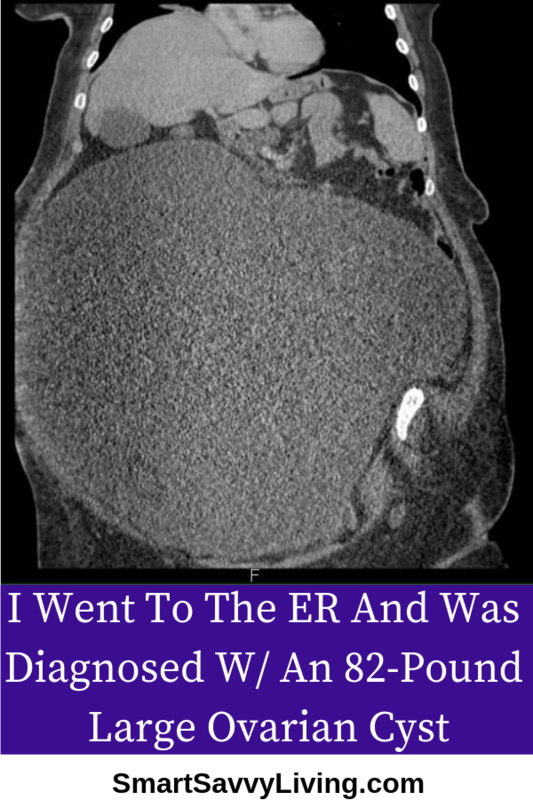 I went to the ER and was diagnosed with an 82-pound large ovarian cyst. No, 82 pounds is not a typo. Here’s my experience in the ER waiting to see what was wrong with me. 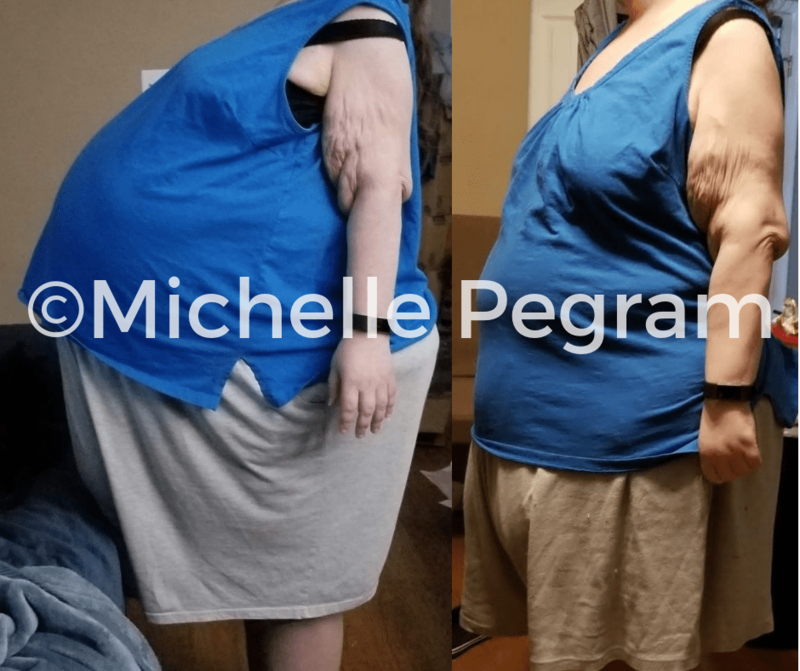 If you’re new here, I recently started a series about my finding out I had an 82-pound giant ovarian cyst growing in me, the surgery to remove it, and my recovery from the surgery and adjusting to such a quick and dramatic weight loss. This was pretty much the last thing I ever expected. Since my full-time job for a while now has been as a self-employed blogger this is obviously been a huge detrimental hit to my income since I couldn’t and still can’t do quite as much work as I am used to nor can I go on disability leave. There have also been a lot of unexpected expenses due to the seriousness of the unplanned major surgery. As such, I am sharing the GoFundMe campaign my wonderful friend set up for me and certainly appreciate any donations and/or shares that you can give. Thank you so much. So, in the previous post, I discussed all the symptoms I was having. As a super short recap, they were symptoms that are pretty common for a variety of not-so-serious reasons but as they got worse and all came together I knew I needed to go to the ER. You can read about them here. This is going to be a rather long series so I thought I’d include a table of contents if you’d like to check out certain sections, especially as I continue to update as my experience unfolds. Mr. Savvy had been super busy with work and stressed out with various projects. I thought my symptoms would eventually go away instead of getting worse. I also didn’t have health insurance because it was too expensive between the monthly cost, co-pays, and deductibles being self-employed and at that income stage of making too much for any subsidies or reduced costs but not enough to actually afford insurance. All of these are reasons why I didn’t go to the ER or doctor sooner. But as the symptoms got worse I knew it was something I needed to do. So, on August 8, 2018 we decided it was time to get things checked out. Mr. Savvy had suggested an urgent care visit but I honestly knew in the back of my mind that something major was probably going on and I was going to need some sort of imaging done. So, around 3 in the morning we headed to the ER at Riverside Regional Medical Center in Newport News. I wanted to go around this time because I didn’t feel like my life was in immediate danger and I didn’t want to have to wait for hours because of the pain I would be in from sitting up for a prolonged period of time. This was actually the first time I’ve ever had to go to the ER for myself, ironically enough. It was a good decision because I didn’t have to wait at all. It was exhausting even just walking to the front desk to check in while Mr. Savvy parked. I opted to be wheeled to a room because I didn’t know if I could even make it walking there. Dr. Cartwright was awesome and I felt like she really listened to what issues I had going on and didn’t judge me for not having come in sooner. This was a relief for me because I was honestly super worried that I would just be told I was overweight and needed to go on a diet. Every time a doctor or nurse asked what made me come in I simply said I feel (and look) like I’m about 12 months pregnant but I’m not pregnant. On the left is the day before I went to the ER the second time. On the right is a few days after I got discharged from the hospital post-surgery. I explained how I had what felt like a pinched nerve earlier in the year and had been taking Aleve daily for an extended amount of time. I was worried at the time something was going on with my liver and the doctor seemed to agree that with the symptoms I was having that could very well be it. In the back of my mind, I was also afraid of something like a tumor or cancer but I was going to take things one step at a time. I had even considered for a moment that it could be something to do with my ovaries as I had seen the article about the woman who had a giant ovarian cyst herself. But, as I mentioned in my previous post, I hadn’t really experienced any gynecological symptoms so I didn’t even consider that as a real possibility. My first nurse was so kind and I have to say she is quite the awesome superstar. Unfortunately, I don’t remember her name to give her a proper shoutout of thanks here. I’ve always had trouble with everyone, whether new or a pro, getting a vein for drawing blood because my veins are apparently smaller than most and burst easily. For example, the only other time I’ve had to be in the hospital was when I was 8 with really bad pneumonia. It took at least 12 hours and probably 10 or more people to get an IV in my arm after I was admitted. Ninety percent of the time I have to have blood taken it takes multiple tries. However, the nurse was able to get a vein and start drawing blood before I could even finish warning her about my usual issues. Sadly things went downhill from here. My nurse later comes back to draw more blood for a few more tests. The doctor eventually comes by and lets us know that to her surprise my liver and other organ functions came back with great values and she wanted me to get a CT scan. At this point, I’m thinking oh f***, it is my ovaries. But, I didn’t say anything out loud and at that point, I was fearing cancer. They come to get me for the CT scan and thus start my woes of how nothing is made for short people. I’m just under 5’3″ so getting up on standard medical tables can already be a struggle for me, nevertheless when I’m carrying around a huge invasive mass. I always wanted to try to move without much help because being over 300 pounds at the time, I didn’t want anyone to hurt themselves trying to help me and I’m just stubborn that way. Luckily, while it took me a few moments, getting on the CT table wasn’t too bad. The scan itself was really quick so I wasn’t on my back for too terribly long so I didn’t have a ton of immense pain even though it took me forever to get back on the hospital bed. I knew an MRI would have taken a lot longer so I was at least thankful for that, at the moment. Probably at least an hour, maybe two, passes, though it seemed like 10 to me as I waited to find out what the heck was actually going on with me. Mr. Savvy had stepped out for a few minutes to get a drink and the morning shift change just happened so the new doctor walked in. Could I Really Have Ovarian Cancer?! He told me that the CT scan showed that I had a rather large mass, likely from one of my ovaries and that the hospital’s gynecologic oncology surgeon would be down to talk to me once he was out of surgery. I was kind of in too much shock to ask any questions I knew he probably wouldn’t be able to answer anyway. I was kind of glad I was alone at the moment so I had a few minutes to process what was going on and what could be going on. That I was obviously going to be having surgery sooner than later and that I could have cancer. Holy mother forking shirt balls I could have cancer and this thing could be so big it’s going to have spread and kill me. As that sinks in, Mr. Savvy is back and frustrated he wasn’t there when the doctor came by. I tell him, well, it’s not great news. I go on to say the doctor says I have a large mass that’s likely coming from my ovary and that the surgeon will come to talk to us when he’s out of surgery and that I don’t know if it could be cancerous or otherwise life-threatening or anything. At some point during all of this, I had also begun vomiting even though all I had was some water so I could give a urine sample. Not long after that, the doctor comes back again and says that they want me to get, oh f***, an MRI. I was already physically and mentally exhausted between having to difficultly move around for the CT scan, trying to get semi-comfortable in an uncomfortable hospital bed, and the explosion of potentially horrible news that no one ever wants to hear. But, I know that stuff is real right now and I need to do whatever the doctors suggest for my own well-being. They also give me an IV injectable for nausea. So begin the 500 questions about any past medical events and metal on/inside your body. Ironically enough, the nurse left the thoroughly taped finger oxygen sensor with metal on my finger but I remembered it by the time I was getting prepped to go into the MRI. It was another struggle to get from the hospital bed onto the MRI table, of course. But I made it. Then I was in what I can quite honestly say is the worse pain I’ve ever been in my whole life. This includes any pain I’ve had thus far post-surgery. I’ve had back pain so bad before that I was almost in tears by the time I got to the top of the stairs but that pain didn’t even come close to what I was about to experience. I expected pain because I knew I would have to be on my back for a long time but I had no idea it would be so bad. I’m lying on the MRI table while they try to situate me so that I am semi-comfortable while still being able to actually fit in the machine with this huge mass and huge pad they have to put on top of it as well. I barely fit to the point it put extra uncomfortable pressure on me. But, I grin and bear it because I know I need to give the doctors the best imaging possible to tackle this thing, whatever it is. At this point, I’m told it will take a while because they want to do an initial scan and then I’ll come back out to get contrast dye injected and go back in for another scan. I have no idea how I’m going to be able to withstand all of this but I know I have to try. So I’m in there for what I think was at least 10 minutes but it could have been less with as much pain as I was in. I didn’t realize just how large the mass was at the time and thus how much pressure it was putting on my spine. The loud machine noises didn’t bother me nor did the fan or tight space. I’m usually pretty good about being able to zone out and calm myself when I know I absolutely need to. However, my back was killing me so I hit the buzzer to say I’m sorry but I need to come out. The tech told me she understood but that there are just a couple more scans that need to happen in the really important area and it should just be a couple more minutes. So I say okay, and try to hold out. What was supposed to be just a couple more rounds ended up being four. I also had no idea the last two would be 2 – 3 times as long as the others. There was no way I could hold my breath that long with this huge mass literally on my lungs. I was also starting to be in so much pain I was literally shaking to where I figured the scan would be useless and I could feel the tears building. After each round, I press the button and say I needed to come out but she keeps telling me just a couple more minutes. Before the last one I even have to swallow my own vomit so I don’t puke all over the MRI and myself. Finally, she lets me out after I say I’m super nauseous and hands me an alcohol swab to help take away my nausea, which actually did work. But I say I can’t do that again because I was just in too much pain. Unfortunately, I was apparently correct that the scan wouldn’t be usable with my shaking. At least I wasn’t charged with it or I’m sure my ER bill would have been much higher than the $8,000 it already is. The tech had to call a nurse a couple times to come to get me and take me back to my ER room, which took forever. I was kind of glad for the alone time, though, because I was able to calm down from all the pain without snapping anyone’s head off. I might still get a little twitchy when I see or hear about MRI’s. Eventually, I make it back to the room where I continue to be nauseous and wait for the surgeon. I didn’t realize it at the time but my gynecologic oncology surgeon, Dr. Irvin, is very well known and in demand across the state of Virginia. There are 12 obstetrics/gynecology residents at Riverside Regional Medical Center and throughout this whole experience, I’ve gotten to meet at least half of them. Dr. Woo is the resident that came over to talk to me about what was going on. He was very nice, friendly, and professional though you could tell he was kind of in awe about my medical situation. He stated that he understood that I wasn’t able to do the MRI and that from what they could see on the CT scan the mass was very large but didn’t seem to be cancerous. He reiterated that pathology would have to be done once it was out to be sure about malignancy but that for now it didn’t appear cancerous and there didn’t appear to be any sort of metastatic disease. That was a huge relief to hear, albeit a very cautious one. We asked how large the mass was and he said approximately 42 cm. I’ll admit that it’s been a very long time since I’ve worked with the metric system so it was a bit hard for me to put that number into context at that moment. That’s about 1.4 feet if you’re like me. He then rather excitedly asked us if anyone had shown us the CT scan, which they hadn’t. He brought the imaging up on the computer in the room and this is what I saw. All I could do was blink my eyes repeatedly and said Oh My God! While I was already worried, it clicked for me just how large and serious this mass was at that moment. 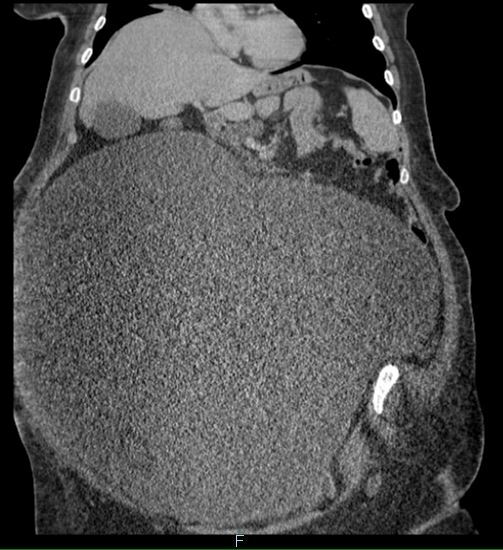 The extremely large area you see in the CT image above is the mass. The organs above it are not supposed to be smooshed together like that. The mass basically pushed up a lot of my organs like my liver and stomach, which explained why I was having so much indigestion and now vomiting. My stomach was so squished the contents didn’t have much place else to go but up and out. In this CT image shot it’s from the angle like I would be laying down. The white ghost-shaped part is my spine. Again, the huge gray area is the mass. It’s no wonder I was having so much back pain. He continued to ask me questions like the symptoms I was having and for how long, about my periods and gynecological past, if cancer ran in my family, how much pain was I in, etc. There was also the big question of if I had children and if it was important to me to continue to have the option to be able to do so. AKA, they couldn’t tell what exactly was going on and I may have to have a total hysterectomy and lose my ability to have a child naturally. They said they’d talk to the surgeon himself and see when I should have surgery. Uh – What Ended Up On The Wall?! Since my pap smear was way overdue and with the other major gynecological issue, they wanted me to have a pap smear. Mr. Savvy leaves to use the bathroom and get a drink. These were just regular hospital beds and not very gynecological friendly so they had me try to prop myself up on a bedpan. Let me remind you that I was over 300 lbs at the time with this huge mass in me so you can probably somewhat imagine how much not fun this was. Now, let me preface this that I am always super polite and professional when it comes to situations like this. I may often curse like a sailor at home but not when it comes to work situations or interacting with people and professionals. So, in goes the speculum which was extremely uncomfortable and not helped by the awkward angle. Then the woman goes for the scraping and it hurt so much I just could not stop saying f*** over and over amidst apologizing for doing so. It hurt so much it almost rivaled the pain of the MRI. I felt ridiculous and so embarrassed and could feel how much I was bleeding. I say, I know it’s been a while but I don’t think pap smears usually hurt quite this much, do they? She casually says, no, they don’t, but you had something that looked red and angry sticking out. Thanks for the warning on that one. And now I’m wondering what the heck else is wrong with me. She goes to fill the vial for the sample and blood and fluids actually go splashing onto the wall. I’m just blinking in embarrassment. After she’s done she notices how much I’m still bleeding and says, I’m just going to stick some gauze and a pad up there. And does so. She asks if I need some help getting dressed. I say no thanks, I need a few more minutes after all that. So much pain. She says I’ll get a call tomorrow if they find anything abnormal. I eventually get up to get dressed again and the bed was absolutely soaked with crimson red blood. After I got dressed, I sat in one of the chairs since the bed was soaked. It was so bad that I kept bleeding for at least three days after that and it wasn’t a period. I remember the doctor walking in and asking how things were going and then seeing the bed as I, somewhat jokingly, say I think that says it all. He says that tomorrow I’ll need to call the surgeon’s office and get an appointment scheduled for next week and that I would be discharged soon. And that I should come back if any of my symptoms start to get worse such as eating nothing, constant vomiting, etc. I was rather disappointed because I was so miserable that it meant I was not going to be having surgery for a while. But I understood that they probably needed time to prepare and get more pre-op bloodwork, etc. At the same time, I was thankful to be getting out of there at that point. I was in so much pain overall and just extremely exhausted. The nurse comes in to discharge me. She says she can’t wait to tell the first nurse what I actually have. She tells me to not hesitate to come back if I need to and that they can call a surgeon right in. Apparently, the first nurse thought I was pregnant and about to pop so she didn’t understand why I came to the ER. I’m sure that was the first impression most had. Mr. Savvy gets all of my stuff and goes to get the car while I wait for someone to come with a wheelchair because there was no way I was walking out at that point. I had a few minutes by myself to reflect on everything that had happened that day and to go through all the paperwork including all the test results. It freaked me out when I read the results of the Cancer Antigen 125 test and they were super high. The standard range is 0.0 – 35.0 and mine was 89.3. My white blood cell and red blood cell count were also high. 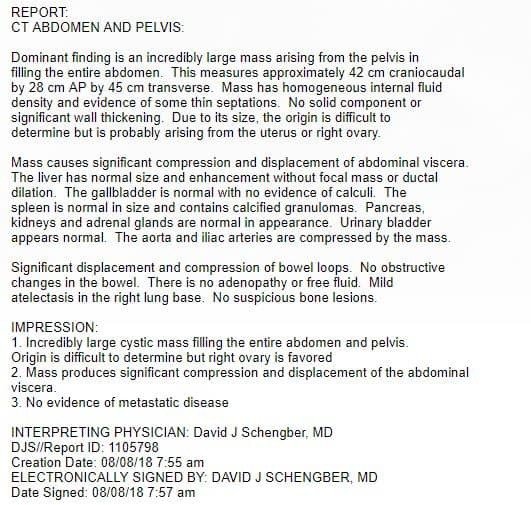 The CT notes stated that I had an “incredibly large cystic mass filling the entire abdomen and pelvis”. And that it was so big they couldn’t even tell where exactly it was coming from. Oh, and my aorta and iliac arteries were being compressed by the mass. Through some research, I learned that it is common for the Cancer Antigen 125 to be high in my situation even if it isn’t cancerous. But, I was obviously still very worried. I told myself that while I was obviously going to be worried until I knew for sure, I couldn’t let myself totally stress out about cancer and instead focus on getting to the next important point, surgery. All I could really think to say at that point was F***, I can’t believe this is happening. And then laughed to myself that if this had been reality TV this would have been a great episode to have a drinking game with the word F***. I’m so tired it’s a struggle getting into and then back out of the car once home. I had to have the help of Mr. Savvy just to get up the one step into the house and then hold onto his arm to walk to and collapse on the couch. I was so tired I knew there was no way I was going to be able to make it upstairs to sleep that night even though it was only around 2 PM. So, I slept on the couch that night. I even had to always make sure a trashcan was nearby because the vomiting was coming on so quickly now I didn’t always have time to make it to the bathroom. I’m not sure if having to be on my back so much squished my stomach more or if it was just pure exhaustion or what. Mr. Savvy went to go get my prescriptions. I opted to only get the one that was about $30 for nausea. I had a second one that was $125 but didn’t want to spend the money since I didn’t think it would really help since the IV medication didn’t help during the MRI. I find out that my appointment with the surgeon isn’t until a week from the next day and wonder how in the heck I’m going to be able to last that long with how miserable I feel. But one foot in front of the other and rest as much as I can in the meantime. Whew, that was long. Next time I’ll recount the experiences and how life went for the next week until I couldn’t take it anymore and went back to the ER. Wow. I’m so sorry that you are going through this ordeal. Hoping for speedy recovery! Oh my!! I had a complete hysterectomy several years ago with a grapefruit-sized ovarian cyst and I thought that was huge! I know how bad I was feeling with that, I can’t even imagine what you went through! Wow. I’m so glad you are documenting your entire experience here.